In the Best of Eleuthera series I decided to do a piece about the Levy Medical centre right here in Governors Harbour. This is the government health clinic that provides medical care for both people who live here and for visitors as well. Not a very pretty shot of the clinic on Queens Highway Governors Harbour – shuttered up for Erika who never came ! The building is there thanks to the wonderful Mr Austin T Levy and his wife June. I knew nothing about them at all until I went along to the clinic and saw the plaque on the wall. I learned that he was a very successful business man and inspirational entrepreneur from Rhode Island in the US . When he visited Nassau in the mid 1930’s he was horrified at the lack of fresh milk, eggs and chickens – so to cut a longer story short he started a 2,000 acre farm in the Hatchet Bay area. Austin Levy died in 1951 but his wife June carried on his work and it seems was responsible for the clinic. Check out the plaque next time you are in the clinic…..
At this stage I do not know how the story unfolded of the donation of funds that built the clinic – but there is a book – The Life and Business Philosophy of Austin T Levy : Visionary Entrepeneur– which I have already ordered and will hopefully have more information. The donation of the building was made in the name of his business – The Hartsville Company. Also check out the Facebook page for the film being made about him. The land was donated for the clinic to be built on by the Honorable Mr and Mrs Asa Pritchard. Mrs Maud Pritchard was formerly a Pyfrom from Governors Harbour so clearly she must have had a gentle but firm hand in the donation of the land. Thanks also to Mrs Joy Pyfrom – in her own words a fount of mis-information !! – for filling in some of the gaps in my research…..
Back to the clinic …. It is open officially 5 days a week from 9am – 5pm – but of course the reality is that they open up for whatever emergencies are needed at whatever hour of the day or night. I interviewed – well chatted with actually – Central Eleuthera District Medical Officer Nurse Sherrin Cooper – she is also the Senior Nursing Officer for the whole of Eleuthera. She went into nursing in 1972 and in 1984 was sent to Hatchet Bay Eleuthera to work in their clinic. That year she met Addison Cooper – her now husband – who at the time was the office manager at the BAIC – Bahamian Agriculture and Industrial Corporation. This was the post independence incarnation of the original company set up by Levy – nice bit of synchronicity there ! In 1985 she transferred to Governors Harbour – she was in charge of School Health for 2 years and then from 1987 has been based at the Levy Clinic in Governors Harbour. 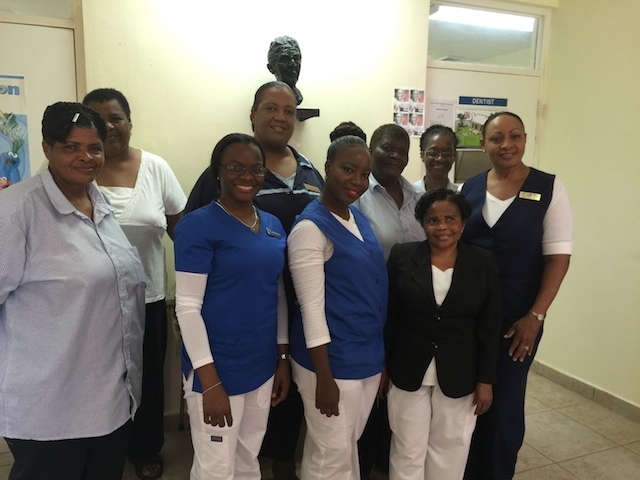 There is one doctor – Dr Mensah who works between the 6 clinics of Central Eleuthera – Gregory Town, Hatchet Bay, James Cistern, Governors Harbour, Palmetto Point and Savannah Sound. Many of you will know of Dr Cliff Bacchus who was the government doctor here for many years – from around 1975 until he retired in 2002. Watch out for a future blog on Dr Cliff Bacchus himself ! There are also 4 other nurses at the clinic – Nurse Freda Cooper – who like CEDMO Sherrin Cooper – is a midwife. Of course home births do not happen here unless it is an emergency – the Nurses Cooper have delivered babies who are now grown and having babies of their own ! Nurse Desamona Henfield, Nurse Angelina Williams and the newest nurse on the team Valencia Douglas who just arrived in Eleuthera this week. Clerical work is done by Iva Cooper and janitorial staff are Barbara Rankine, Christine Sands and Sharon Johnson. Don’t mess those files up whatever you do ! Various specialist clinics are held at the Levy building including family planning and reproductive health, ante-natal, lab investigations ( blood tests etc ) chronic non- communicable diseases ( heart disease, blood pressure, diabetes) and of course these days following a government directive, raising awareness of healthy eating, preventative care and healthy lifestyle are strongly promoted. Emergencies are dealt with in the early stages at the clinic and Nurse Sherrin Cooper tells me that there are usually only a couple of emergency flights per month where patients have to be medically airlifted to Nassau. The advent of tele medicine could be a great benefit to those of us who live in the Family Islands but in the meantime let’s give thanks for generosity and kindness of people like the Levys and the Pritchards without whom Governors Harbour would be a poorer place ……. Hopefully you will not need it but the telephone number for the clinic is 332 2774. What a great report! Loved the 1963 opening brochure with island family names, Burrows, Culmer, Pinder, Rolle…and the raffle prizes are gas. It always amazes me that so many places don’ t look like much but there is such rich history and resources beyond face value. High net income earners take note!! Great and informative article Kathy! I am certainly grateful for the facility and its staff. I think we all are ! A nine hour opening ceremony complete with a baby beauty contest and horse racing – what a celebration! It is good to know about the background of the clinic and the hard-working health staff! I just love the sound of the competitive dancing !! Excellent write-up on Eleuthera history – thanks Kathy and all concerned. Thank you – hope to see you soon…..